Smartphones and mobile apps have become the key success enablers in today’s ties. To help you cope with the rising demand, Wrebb Digital Solutions offers end-to-end expertise in developing and launching highly functional and scalable mobile applications. We are an upcoming Mumbai based mobile app development company offering services for both iOS and Android devices. We have cultivates a blend of youthful enthusiasm and industry expertise to deliver mobile apps as per your exclusive needs. By utilizing the latest technologies and modern tools, we create customized mobile application suiting your business requirements. Why choose Webb Digital Solutions? We Create Smarter Apps for Smarter Businesses. We create interactive and unique iPhone applications using the ongoing advancements in iOS technologies. It helps you grow your business, making it performance oriented. Our experts are always determined to develop user friendly apps. Our experts create bug-free apps for your iPads, keeping in mind the quality of applications. We ensure the plan is framed and executed in an industry-endorsed systematic manner. 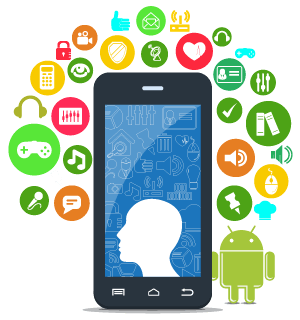 Whether it is a social media app or education and learning app, we design Android apps for companies in diverse industries. From restaurants to health care, there is nothing our experts can’t design an Android app for. We have dedicated and professional app developers who maintain high quality and authenticity of mobile applications. We have a special team of developers trained in hybrid apps development. On hiring our services, you get affordable cross-platform solutions with minimum alterations. Mobile applications for websites we enable business owners to have the benefits of our custom mobile app development services. It helps them reach their potential customers on mobile devices. This is how we keep them connected to a large audience 24hours a day. Users can get any and every web information on their phones through our easy-to-use mobile apps. Corporate solutions We also serve large corporate software systems with a deeply personalized mobile app development services to let them extract the max from mobile apps. Our apps are designed in sync with your corporate software systems with maximum information flow. This helps you take a lead and leave your competitors behind in the race. Gadgets for mobile phones Wrebb Digital solutions design creative and authentic mobile gadgets based on client’s requirement. Basically, we create mobile business applications, keeping your expectations in mind. Our innovative developers and creative designers also develop entertainment apps and interactive mobile games for the global clients. Are you in search of a reputed mobile application development company in Mumbai? We are right here at your service!